Visual primitives for the component age. Use the best bits of ES6 and CSS to style your apps without stress ???? styled-components is compatible with both React (for web) and ReactNative – meaning it's the perfect choice even for truly universal apps! See the documentation about ReactNative for more information. Note: If you're not using npm as your package manager, aren't using a module bundler or aren't sure about either of those jump to Alternative Installation Methods. Made by Glen Maddern, Max Stoiber and Phil Plückthun, supported by Front End Center and Thinkmill. Thank you for making this project possible! There is (currently experimental) support for stylelint – meaning you can take advantage of 150 rules to make sure your styled-components CSS is solid! 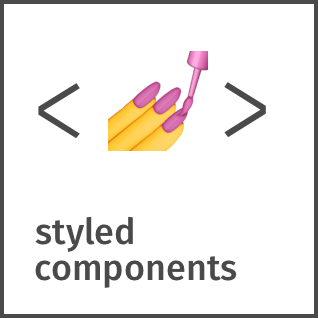 See the stylelint-processor-styled-components repository for installation instructions. The one thing you lose when writing CSS in template literals is syntax highlighting. We're working hard on making proper syntax highlighting happening in all editors. We currently have support for Atom, Visual Studio Code, and soon Sublime Text. @gandm, the creator of language-babel, has added support for styled-components in Atom! We could use your help to get syntax highlighting support to other editors! If you want to start working on syntax highlighting for your editor, open an issue to let us know. uiGradients: Generate beautiful background gradients from the uigradients.com database. react-enhanced-form: The best react form component, on earth ????. It makes form inputs easy, finally ! react-teleportation: Teleport your components to the foreground. styled-components-spacing: Responsive margin and padding components for styled-components. Hedron: A no-frills flex-box grid system. styled-components-grid: Responsive grid components for styled-components. react-flexa: React grid system implementing the flexbox CSS API responsively. griz: The simplest grid system you'd ever see. Using grids with a flexbox fallback. styled-components-breakpoint: Utility function for using breakpoints with styled-components. styled-theme: Extensible theming system for styled-components. styled-tools: Useful interpolated functions for styled-components. react-create-component-from-tag-prop: Create a react component from a tag prop. Lets your users to choose which HTML elements get styled by your ???? styled-components. styled-shortcut-components: A convenience package that wraps styled-components with styled-shortcuts. sachagreif.com: personal homepage built with Gatsby (source). ismaywolff.nl: personal portfolio with serverside rendering (source). Reactiflux: Reactiflux community home build with Gatsby (source). michaelhsu.tw: A simple static homepage built with CRA pre-renderer (source). joeireland.com: Portfolio of Joseph Ireland (source). rosesdaycare.center: Marketing website with theme colors that change on refresh (source). CodeSandbox: An online editor tailored for React development (source). Grabient.com: A beautiful and simple UI for generating web gradients. (source). react-presents: Highly customizable React slideshow framework with syntaxt highlighting and mobile support. Built something with styled-components? Submit a PR and add it to this list! ???? Create a style guide using NPM & styled-components: Jamie fumbles through creating a shareable NPM package. If you're not using a module bundler or not using npm as your package manager, we also have a global ("UMD") build! You can use that via the unpkg CDN to get styled-components, the URL is https://unpkg.com/styled-components/dist/styled-components.min.js. glamorous - basically styled-components but using JS objects and functions instead of strings. Licensed under the MIT License, Copyright © 2017 Glen Maddern and Maximilian Stoiber.